Class Times: There will be three live class meetings. For a description of the class, its assignments, requirements, schedule, and a biography of the instructor, see below. To apply, click here. Note: If you wish to apply for more than one class, you must apply for each class with a separate application. For more information on Odyssey's Online Classes, click here. Description is critical in good, immersive fiction. It first and foremost enables the reader to richly imagine the world that a writer has created. But good description does more than provide the sensory and physical details crucial in setting, characterization, action, and world building. The ways in which characters see and describe their worlds deepen personality, establish point of view, convey motivation, ratchet up tension, and move the plot. Ultimately, the description is the thread that connects the who, what, when, where, and why in any narrative. Join award-winning author/editor Lucy A. Snyder for this online course on understanding and mastering description. We'll start by looking at great examples of description from both classic fiction and recent science fiction, fantasy and horror ... and we'll contrast those examples with problematic descriptions. We will drill deeper into the role of word choice in description, and how to keep your readers engaged whether you're writing for children, teens, or adults. We'll examine how to employ poetic techniques in good prose description, and how to provide specific, vivid, evocative details. Students will also learn how to avoid common descriptive pitfalls such as "pushbutton" words, unconscious bias, and used furniture. In our final session, we'll discuss effective techniques for using description to maintain tension and plot momentum and create unforgettable characters. Before or after each session, students will work on exercises that will help them apply the lessons of each session to their own writing. They'll emerge from this workshop able to determine whether a descriptive passage enriches or distracts from other narrative elements; more critically, they'll be able to revise passages to remedy the problems they see. Students will leave this workshop with new narrative tools at their disposal to create the kinds of stories that keep readers engaged. Students must be ready to hear about the weaknesses in their writing and to work to strengthen them. Students must also be ready to give feedback to their classmates that is both truthful and helpful. Our goal as a class is to provide a supportive yet challenging, energizing environment that will help students improve their writing. Each student will have a private meeting with Lucy. The course is intended for writers of fantastic fiction, an umbrella term encompassing fantasy, science fiction, horror, magical realism, and anything in between. Yet description is important in all fiction writing, so fiction writers who focus on other genres could profit from this class and would be welcome. The course will cover description in middle grade, young adult, and adult fiction. Since the class will define and explain the terms and techniques discussed, beginning writers should be able to understand the concepts and incorporate them into their writing. Yet the course will be most valuable for intermediate writers who already have some skill with description, style, characterization, and point of view. Students will be required to complete several readings before the course begins; these will be announced by early December. They will not be expensive. Additional readings will be required after the course begins. Students will have some homework assigned before the first meeting, and will also be assigned homework during the course. The first assignment will have a due date of January 2, the day before our initial meeting. Homework will be assigned on January 3 and January 17, with due dates, respectively, of January 9 and January 23. You will also be required to provide critiques of some of your classmates' work, which will be due on January 16 and 30. Any student who misses a deadline may be expelled from the class and will receive no refund. All assignments should be in standard manuscript format and should be submitted as MS Word files or rich text files. You should reserve a minimum of 5 hours each week to complete homework. Assignments will include reading and analyzing assigned texts, critiquing, performing exercises to practice techniques, writing new material, analyzing your previously written material, and revising previously written material. The instructor will return students' homework with her feedback by the day before the next class session. Students are expected to follow the policies about assignments and class materials in the Odyssey Online Student Handbook. Since we will have only 3 class meetings, attendance at every class is necessary for students to get the most out of this course. You are expected to attend all classes, except in cases of emergency. In such cases, you should notify the instructor. It is your responsibility to find out what happened in any classes you missed and to complete homework by the deadlines. Classes will be recorded and made available to students for a limited time. On rare occasions, students' computers do not allow them to access the recordings, so we cannot promise that this will work for you. Any student who misses more than one class may be expelled from the course and will receive no refund. It is your responsibility to find out what happened in any classes you missed and to complete homework by the deadlines. Students are expected to follow the policies set out in the Odyssey Online Student Handbook. Technical requirements for all Odyssey Online Classes are covered on the Online Classes page. First class meeting. Introduction and orientation. We will discuss the pre-class readings and assignments and discuss recent and classic examples of description with a general discussion of the qualities of excellent description. We will also discuss how to select which elements should be described. Assignment of homework. Critiques are due. Homework is returned with Lucy's feedback. Second class meeting. Discussion of homework. We will drill deeper into the role of word choice in description, how to know how much description to provide, how to identify details that accomplish multiple purposes, where to place details, how to employ poetic techniques in good prose description, and how to provide specific, vivid, evocative details. We will also discuss the particular challenges of describing fantastic or science fictional settings. Student questions. Assignment of homework. Four students will have private meetings with Lucy between 8:30-9:30 PM EST. Five students will have private meetings with Lucy between 7:00-8:15 PM EST. Third class meeting. Discussion of homework. We will examine effective uses of description in moving the plot ahead, increasing tension, and developing characterization. We will also explore how to use subtext to suggest more than you say and how to write description with emotional impact. Student questions. How to continue your progress. Five students will have private meetings with Lucy between 8:30-9:45 PM EST. Lucy A. Snyder works as a freelance developmental editor and is the five-time Bram Stoker Award-winning author of 14 books and over 100 published short stories. She's the co-editor (with Michael Bailey) of Chiral Mad 4. Her most recent books are the collection Garden of Eldritch Delights and the forthcoming novel The Girl with the Star-Stained Soul. She also wrote the novels Spellbent, Shotgun Sorceress, and Switchblade Goddess, and the collections While the Black Stars Burn, Soft Apocalypses, Chimeric Machines, and Installing Linux on a Dead Badger. 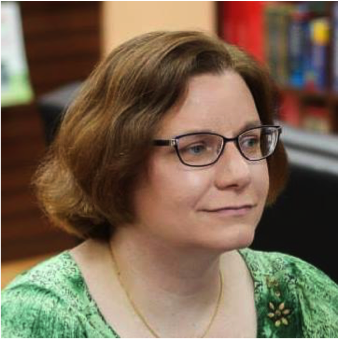 Her writing has been translated into French, Russian, Italian, Spanish, Czech, and Japanese editions and has appeared in publications such as Asimov's Science Fiction, Apex Magazine, Nightmare Magazine, Pseudopod, Strange Horizons, and Best Horror of the Year. She's also faculty in Seton Hill University's Master of Fine Arts in Writing Popular Fiction program. You can learn more about her at www.lucysnyder.com.